The Taj Mahal , is a monument located in Agra, India, constructed between 1631 and 1654 by a workforce of 20,000. The Muslim Mughal Emperor Shah Jahan commissioned its construction as a mausoleum for his favourite wife, Arjumand Bano Begum, who is better known as Mumtaz Mahal. The Taj Mahal (sometimes called "the Taj") is generally considered the finest example of Mughal architecture, a style that combines elements of Islamic, Indian, Persian and Turkish architecture. The Taj Mahal has achieved special note because of the romance of its inspiration. While the white domed marble mausoleum is the most familiar part of the monument, the Taj Mahal is actually an integrated complex of structures. Soon after its completion, Shah Jahan was deposed and put under house arrest at nearby Agra Fort by his son Aurangzeb. Legend has it that he spent the remainder of his days gazing through the window at the Taj Mahal. Upon Shah Jahan's death, Aurangzeb buried him in the Taj Mahal next to his wife, the only disruption of the otherwise perfect symmetry in the architecture. By the late 19th century parts of the Taj Mahal had fallen badly into disrepair. During the time of the First war of Indian Independence the Taj Mahal faced defacement by British soldiers, sepoys, and government officials who chiseled out precious stones and lapis lazuli from its walls. At the end of the 19th century British viceroy Lord Curzon ordered a massive restoration project, completed in 1908. He also commissioned the large lamp in the interior chamber (modelled on one hanging in a Cairo mosque when local craftsmen failed to provide adequate designs). It was during this time the garden was remodelled with the more English looking lawns visible today. By the 20th century the Taj Mahal was being better taken care of. In 1942 the government erected a behemoth scaffolding over it in anticipation of an air attack by the German Luftwaffe and later by the Japanese Air Force (see photo). During the India-Pakistan wars of 1965 and 1971 scaffoldings were erected by the government to mislead would-be bomber pilots. Its most recent threats came from environmental pollution on the banks of the Yamuna River including acid rain occurring due to the Mathura oil refinery (something opposed by Supreme Court of India directives). As of 1983 the Taj Mahal was designated a UNESCO World Heritage Site. Today it is a major tourist destination. Recently the Taj Mahal was claimed to be Sunni Wakf property, on the grounds that it is the grave of a woman whose husband Emperor Shah Jahan was a Sunni. 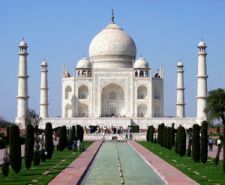 The Indian government have dismissed claims by the Muslim trust to administer the property, saying their claims are baseless and the Taj Mahal is Indian national property.